Description: US Scott US 35 pays the standard 10 cent rate on a cover from the east of the Mississippi to California. Description: 10c postage due on cover bearing provisional receipt due to lack of postage stamps. Description: 10c and 15c 2nd Bureaus plus 10c postage due on parcel label. Description: U71 use from Nevada to California. Non-philatelic use of a high value Nesbitt envelope. Description: US Scott 65 franks intrastate RI cover with 1863 year dated postmark. 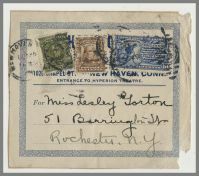 Description: US Scott 65 pays the regular mail rate for a cover from MA to NH, with 1862 year dated postmark.